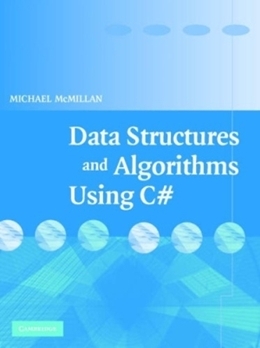 In this book, Mike McMillan provides a tutorial on how to use data structures and algorithms plus a comprehensive reference for C# implementation of data structures and algorithms found in the .NET Framework library, as well as those developed by the programmer. The approach is very practical, using timing tests rather than Big O notation to analyze the efficiency of an approach. Coverage includes arrays and array lists, linked lists, hash tables, dictionaries, trees, graphs, and sorting and searching algorithms, as well as more advanced algorithms such as probabilistic algorithms and dynamic programming.